Recalling the start of her collection, Sponaugle laughs, “At first, I was going to buy only the ones that I really, really liked. That lasted about ten minutes!” Indeed, her first PEZ purchase was at her local K-Mart, which carried about 25 different designs – and she bought them all. 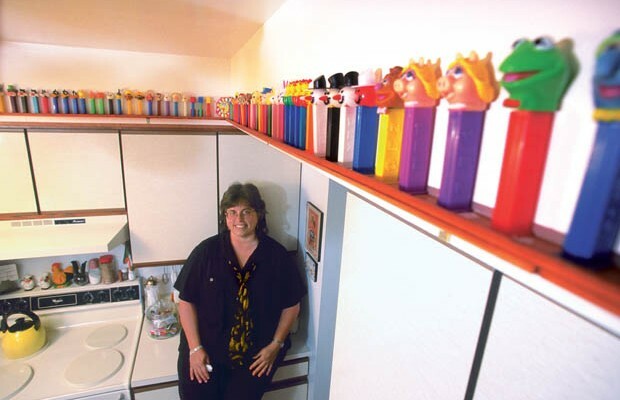 But don’t get the wrong impression – Sponaugle’s life consists of more than collecting PEZ. In fact, she is definitely not a stereotypical eccentric collector. Sponaugle and her husband, Bob, have been married eleven years, and she works in the sales department of a film production company. Sponaugle loves to shop and read, and her and Bob’s favorite place to visit is Cape May, NJ. In addition, they spend much of their spare time volunteering with NAAFA, an organization that educates, supports and advocates for people all sizes of large.